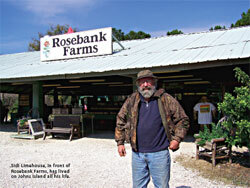 No Visit To Johns Island would be complete without a stop at Rosebank Farms, a traditional roadside market famed for its fresh produce and fine flowers. Located on Bohicket Road, within "spittin- distance" of the glittering resort communities of Seabrook and Kiawah Islands, it is a land­mark that harks back to an earlier era, when the region, now engulfed by explosive upscale growth, was a rural community where agriculture reigned. Presiding over Rosebank Farms is its founder and owner, Sidi Limehouse, a beefy, bearded man of 68 who traces his family-s Charleston heritage back to the 1700s. Limehouse himself was born on Johns Island in 1938, at a time when the total population numbered some 4,000 souls. His family raised cattle and hogs and harvested potatoes from hundreds of acres of fertile Lowcountry soil. Hunting and fishing were year-round occupations-the deer season stretched from August through New Year-s Day-and everyone on the island knew one another.
" McGowan lamented that, "We-ve been trying to sell Kiawah Island for two or three years now for $50,000, and we haven-t gotten a single bite. " That-s all changed now-not neces­sarily for the better, in Limehouse-s view-with the development of the area as a popular vacation destina­tion and site for elegant luxury homes. Nonetheless, he admits that he wouldn-t live anywhere else. In fact, had fate taken a simple turn for the Clemson agricultural engineering graduate and former member of the South Carolina House of Representatives, he might have become the emperor of his Johns Island domain. The year was 1948, and Sidi recalls sitting around the kitchen table with his father, his brother, his great-uncle and family friend Russell McGowan, an attorney who represented the Vanderhorst family, which owned Kiawah Island. McGowan lamented that, "We-ve been trying to sell Kiawah Island for two or three years now for $50,000, and we haven-t gotten a single bite." Turning to Sidi-s father, he said, "I want to sell it to you today, for $25,000 barrel-head money." Mr. Limehouse thought that sounded like a pretty good deal, and young Sidi agreed. But his father was talked out of the purchase because hardly anyone in the Lowcountry thought Charleston would amount to much. After the World War II economic boom fizzled out, the conventional wisdom was that the Holy City would never be more than a sleepy Southern community. "You have to remember that in downtown Charleston, people used to paint only the front-the street side-of the columns on their houses," Sidi says. "The back part was never painted because passers-by couldn-t see it from the roadway." At that time, Limehouse notes, Johns Island itself was so remote that it didn-t even have electricity. His family managed to rig a usable system through a friend who worked on elec­tric-powered submarines at the Navy Yard. He helped them obtain a dozen big, glass batteries that had been used on the subs. Each afternoon, they would run a generator hooked up to the batteries until the gasoline ran out, providing power "until maybe around 10 o-clock that night." Telephone service eventually came to the island but not to the Lime­house family. "All that was offered were party lines, and my father wanted no part of being on a party line," Sidi explains. It was also a time when no one believed people would actually live on the beach at Kiawah. "You could buy a beach-front lot for $500, build a little shack on it, use it for 10 years and then knock it down, because it would have been stupid to build anything better," he adds. The area was simply too remote. Air travel wasn-t yet commonplace and a national interstate highway system was still years away. Plus, Limehouse recalls, "Between the mosquitoes and the heat, it was just miserable in the summertime." And that leads to Sidi Limehouse-s verdict concerning the one man who deserves both the credit and the blame for lighting the fuse on the population explosion that began on Johns Island in the 1960s and continues to this day. His name was Willis Haviland Carrier, and he never lived in South Carolina. He did, however, invent modern air conditioning, "and that-s what brought all the Yankees here."